A judge recently found a Cleveland police officer not guilty for fatally shooting two unarmed Black victims who fled from police by car. And community outrage over police brutality continues to rage on. 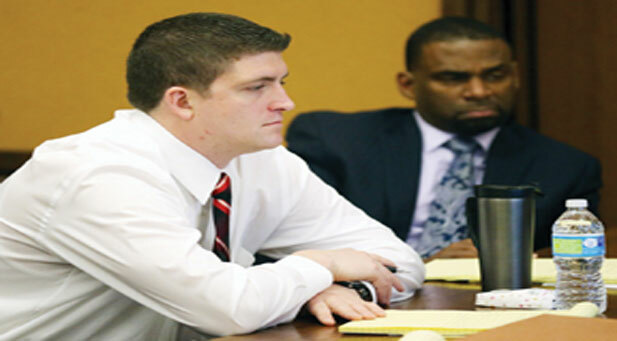 A judge found Cleveland Police Officer Michael Brelo not guilty Saturday morning for the fatal shooting of two unarmed Black victims fleeing police in their car. Brelo was part of an unauthorized 59-car police chase in which 137 shots were fired, leaving Timothy Russell and Malissa Williams dead. Protests were immediate in the wake of Judge John O’Donnell’s public announcement. Investigators found that 13 officers had fired shots in what started as a routine police drug patrol. But Brelo, who fired 49 of those shots, was the only one charged because prosecutors said he stood on the hood of his car and opened fire even after other officers had stopped shooting. He faced charges of voluntary manslaughter. In his ruling Saturday morning, O’Donnell reasoned that he couldn’t find beyond a reasonable doubt that the deaths of Russell and Williams were caused by Brelo’s gunshots, since some of the 12 other officers who fired gunshots could have contributed to their deaths. He also said the actions of all of the officers were justified by their reasonable fear of death or great bodily harm at the time, even though the officers later learned that neither Russell nor Williams had a gun in their car as they fled from officers. But in the hours following his announcement, the outrage over O’Donnell’s legal distinctions was swift. U.S. Rep. Marcia Fudge (D-OH) called the ruling a “stunning setback.” “Today we have been told — yet again — that our lives have no value,” she said in a statement. “We are witnessing failure of legal technicalities in accounting four Black death,” George-town professor Michael Eric Dyson tweeted. The 2012 incident occurred several years before national attention turned to police brutality after the death of Michael Brown. Since Brown’s death, at least two deaths involving the police in Cleveland have sparked particular outrage — that of 12-year-old Tamir Rice, and Tanisha Anderson, a men-tally ill woman who police said “went limp” in their hands, while family members say they saw her thrown to the ground. Speaking for almost an hour, O’Donnell attempted to urge nuance in the face of acknowledged community out-rage over police brutality. “Every week I pass a mound of stuffed animals left for a 12-year-old that many people believe was murdered by the police,” O’Donnell said. He said “this animosity is fed” not just by “clickers” but by “honest people treated as criminals” and “unnecessarily brutal treatment of suspects.” He nonetheless rejected notions that his ruling should have bearing on this larger debate. “If the evidence did not show beyond a reasonable doubt that he knowingly caused their deaths … then I will not sacrifice him to a public frustrated,” O’Donnell said. The chaotic 2012 car chase was considered a department-wide malfunction and prompted an investigation by the Department of Justice into the city police department’s use of excessive force and the “the adequacy of CPD’s training, supervision, and accountability mechanisms.” In spite of a police policy that no more than two vehicles be involved in a chase, more than 59 vehicles joined the pursuit “without the sector supervisor’s knowledge or permission,” according to a state investigation of the incident. The chase began after a car pulled over for a turn signal violation drove away, and was later identified by several other officers driving at a high speed. Due to faltering communication, and the misimpression that the individuals were armed and fired a shot, the incident escalated until one-third of the police department had joined the chase. Brelo was the only officer who faced criminal charges. But Prosecutor Timothy McGinty said he was encountering resistance from potential police witnesses known as the “blue wall of silence.” He said 16 police officers declined to meet with him prior to the trial to review their testimony. In court filings, he compared their refusal to cooperate to actions of an “organized crime syndicate” and asked the court to consider them hostile witnesses. O’Donnell acknowledged that Brelo violated his training and put other officers at risk when he stood on the hood of a car without any cover and continued firing. But he nonetheless maintained the action was justified. “I reject the claim that 12 seconds after the shooting began it was patently clear from the perspective of a reasonable officer in Brelo’s position that the threat had been stopped,” he said.